As promised, we’re releasing the third updated version of Inspire within the week. The latest version available now is Inspire 2.23. Update Inspire directly from within the app or download it here if you haven’t already. Let’s take a look at what’s new in the latest version. Spoiler alert, the list is long. 1) We added 5 styles that you can choose to export your work to with the DOCX format. Not only that, we also improved the export and preview support when export to DOCX. We said that this feature was not yet perfect, but this change is a big step ahead. Have fun trying the rest of the 4 styles and choose the one that looks the best for your work. 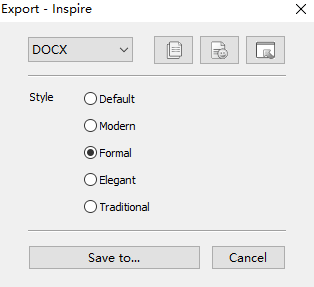 2) Apart from exporting to DOCX files, you now can import a DOCX document into Inspire for further editing. Just go to File > Import… and select your target file. Simple as that. 3) As promised, on Inspire 2.23, we updated the German version of the introduction. We owe it big to Peter, one of our warmed-hearted users who has devoted his time and effort into Inspire. Thanks mate! What more do you want to see is us? Feel free to let us know, and we’d be in touch real soon.